Sacramental Mothering: To Arms! To Arms! Let me re-phrase this. If you are a white, Anglo-Saxon, protestant, of middle class income, you know who this is. It is Felicity Merriman of Williamsburg. She is a horse lover, friend to Elizabeth Bennet and fledgling patriot. 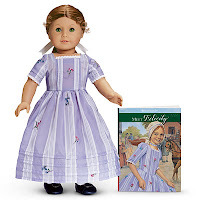 She is one of the historical characters sold by American Girl. In fact, she is one of the original American Girls. She is also being retired by the Mattel after Christmas. Say it isn't so! In our house this is treason. Treason I say! How can you have an American Girl Doll company and not feature the American Girl who was present at the birth of our nation?! It's an outrage. First, they retired Kirsten, the pioneer doll, now this. Are the American Revolution and Western Expansion passe? Who's next Kaya? Josphina? Molly? I used to be able to justify the expense, mostly because Grandpa and Aunt Janet pay for it all, but recently I have begun to contemplate a boycott. Just like Felicity boycotted tea to protest the tax, I should boycott American Girl. I should decry their marketing strategy. "Is life so dear, or peace so sweet, as to be purchased at the price of chains and slavery? Forbid it, Almighty God! I know not what course others may take; but as for me, Give me Felicity or give death!" Maeve and Hilde are all for this protest. We are united against this injustice. As long as it is after Christmas and Grandpa and Aunt Janet have purchased all the Felicity items Hilde requires and Maeve gets that tap dance outfit before American Girl black lists us.